Bryan’s Story: I met Keith & Tana Davis at the Garden Conservancy Spring Garden tour of Pikake Botanical Gardens in May of 2005. Somehow we got to talking and when he discovered that I had created Pikake, he came up to me and hugged me. He told me that he had been looking for me (or someone like me) for a long time. Being hugged by a strange man surprised me but it was the beginning of a great working relationship and friendship. At the time, I knew nothing about the Tree of Life. I soon discovered that the essence of the Tree of Life is a recurring theme to be found in Judaism and Christianity; but also in Mexican Folklore, Celtic history and in Buddhism. Teaching also demonstrates that the pillars and Seferots of the Tree of Life exist in us all. 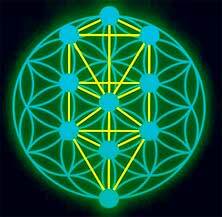 I began to study the Kabala and the Tree of Life, not so much from a spiritual standpoint but from a technical one. The Tree of Life was developed to be a mental exercise and now we were going to build it on the ground in a garden so that people could actually walk it and physically experience this spiritual path to enlightenment. What really fascinated me was the Sacred Geometry manifested by the intertwining relationships of the seven circles and twenty two paths that define and locate the Ten Seferots of the Tree of Life. For me, when a solution is so fundamentally elegant, there is always a more profound reason for it. Designing and building this project was quite a challenge, The portion of the property that Keith had selected for this unique project was basically flat and devoid of all life save weeds. He had already placed boulders in the approximate locations of the Seferot as he perceived their relationship. In my opinion, the space was too limited in size and the nearly square dimensions did no lend themselves to accurately representing the elongated rectangle in which the Ten Seferot reside. The solution was serendipitous; to the south of the original location, lay more unused space of a nearly identical size covered with Live Oak and a multitude of other Native plants. This space sloped up as it receded from the original almost level area. We proceeded to selectively prune up the Live Oaks so that we might walk under them, carefully remove the Poison Oak that carpeted parts of the slope and open up the spaces between the native shrubs so that we could see through the space. In order to place this on the ground, the exact proportions of the Sacred Geometry of the Tree of Life had to be blown up to fit the site. When constructed, the distance from the center of Malkuth (bottom) to the north and Keter (crown) to the south, would be two hundred feet. The width from side to side was almost eighty feet. The actual site was much larger because we needed room to surround and enclose the Walk so that it could be experienced in isolation from the distractions of the outside world. When completed, the overall dimensions of the Garden would exceed 250’ by 120’. These points needed to be laid out in an exact relationship to each other over irregular and sloping terrain. Everything had to be triangulated, and triangulated again until each point fell into place. Because this walk to enlightenment is a walk of reflection into your owner inner self, I felt it was important to undulate and snake the paths from one Seferot to the next so that, at each point one may be isolated and, as one moves on, one discovers the next point in the path. A each point, we installed a small flagstone patio set in DG and placed compact boulders around it for seating. Located in the center of each patio, a metal sculpture representing Keith’s vision of the essence of that Seferot was placed. These incredible sculptures were created by master iron worker Clint Crossly of Catalonia Metal Design and were finished with a chemical which gave them the look of a long rusted iron sculpture.